A sign to the campus offices of chipmaker Broadcom Ltd, who announced on Monday an unsolicited bid to buy peer Qualcomm Inc for $103 billion, is shown in Irvine, California, Nov. 6, 2017. Chipmaker Broadcom made an unsolicited $103 billion bid for Qualcomm on Monday, setting the stage for a major takeover battle as it looks to dominate the fast-growing market for semiconductors used in mobile phones. Qualcomm said it would review the proposal. The San Diego-based company is inclined to reject the bid as too low and fraught with risk that regulators may reject it or take too long to approve it, people familiar with the matter told Reuters. A Broadcom-Qualcomm deal would create a dominant company in the market for supplying chips used in the 1.5 billion or so smartphones expected to be sold around the world this year. It would raise the stakes for Intel Corp, which has been diversifying from its stronghold in computers into smartphone technology by supplying modem chips to Apple. Qualcomm shareholders would get $60 in cash and $10 per share in Broadcom shares in a deal, according to Broadcom's proposal. Including debt, the transaction is worth $130 billion. GBH Insight analyst Daniel Ives said bullish investors were hoping for $75 to $80 per share. "Now it's a game of high-stakes poker for both sides," he said. Shares of Qualcomm, whose chips allow phones to connect to wireless data networks, traded above $70 as recently as December 2016 and topped $80 in 2014. Qualcomm's shares were up 2 percent at $63.09 at mid-afternoon, suggesting investors were skeptical a deal would happen. Broadcom shares fell 0.3 after hitting a record high of $281.80. A sign on the Qualcomm campus is seen in San Diego, California, Nov. 6, 2017. Qualcomm's largest market is the so-called modem chips that allow phones to use mobile data plans, but it also sells connectivity chips for automobiles that handle "infotainment" systems and wireless electric vehicle charging. Qualcomm provides chips to carrier networks to deliver broadband and mobile data. Any deal struck between the two companies would face intense regulatory scrutiny. A big hurdle would be getting regulatory approval in China, on which both Qualcomm and Broadcom rely on to make money. China is set to look at any deal closely after U.S. regulators blocked a flurry of chip deals by Chinese firms due to security concerns, thwarting the Asian country's attempt to become self-reliant in chip manufacturing. Broadcom could spin out Qualcomm's licensing arm, QTL, to get regulatory approval and funding for the deal, raising as much at $25 billion from a sale, Nomura Instinet analyst Romit Shah suggested. Broadcom had $5.25 billion in cash and cash equivalent as of July 30. Qualcomm had $35.03 billion as of Sept. 24. Broadcom said BofA Merrill Lynch, Citi, Deutsche Bank, JP Morgan and Morgan Stanley have advised it they are highly confident that they will be able to arrange the necessary debt financing for the proposed transaction. The company has also got a commitment letter for $5 billion in financing from private equity Silver Lake Partners, an existing Broadcom investor. Broadcom approached Qualcomm last year to discuss a potential combination, but did not contact Qualcomm prior to unveiling its $70 per share offer Monday, according to sources. 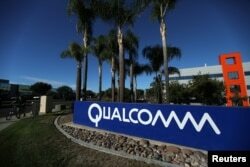 Qualcomm is more vulnerable to a takeover now because its shares have been held down by a patent dispute with key customer Apple, as well as concerns that it may have to raise a $38 billion bid for NXP Semiconductors NV that it made last year. Broadcom, Qualcomm and NXP together would have control over modems, Wi-Fi, GPS and near-field communications chips, a strong position that could concern customers such as Apple and Samsung Electronics because of the bargaining power such a combined company could have to raise prices. However, a combined company would also likely have a lower cost base and the flexibility to cut prices. Broadcom said its proposal stands irrespective of whether Qualcomm's acquisition of NXP goes through or not. Qualcomm's entire 10-member board is up for re-election this spring, and Broadcom could seize on the Dec. 7 nomination deadline to put forward its own slate. Broadcom Chief Executive Hock Tan, who turned a small, scrappy chipmaker into a $100-billion company based in Singapore and the United States, told Reuters he would not rule out a proxy fight. "We are well advised and know what our options are, and we have not eliminated any of those options," said Tan, who has pulled off a string of deals over the past decade. "We have a very strong desire to work with Qualcomm to reach a mutually beneficial deal." Tan added that if Broadcom acquires Qualcomm which in turn has acquired NXP, the combined company's net debt could be in the range of $90 billion. Two Qualcomm directors, Anthony Vinciquerra and Mark McLaughlin, have been aligned with activist hedge fund Jana Partners LLC, which pushed for a shakeup of the company two years ago. Jeffrey Henderson, another Qualcomm board director, was added last year as a compromise candidate. Apple, as a key customer, could pose a risk to the deal, said Karl Ackerman, an analyst at Cowen. Tan told Reuters that Broadcom taking over Qualcomm would improve relations with Apple: "We believe we can be very constructive in resolving these issues and resetting relationships." Broadcom plans to move its headquarters solely to the United States, which would allow it to avoid review by the Committee on Foreign Investment in the United States, which reviews foreign ownership of U.S. assets. Broadcom's offer represents a premium of 27.6 percent to Qualcomm's closing price of $54.84 on Thursday, a day before media reports of a potential deal pushed up the company's shares.